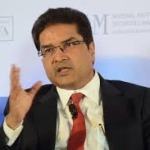 Basant Maheshwari’s modus operandi, when it comes to investments, is three-fold. First, Basant likes to be “ahead of the curve” in identifying themes that will become popular. Second, Basant trusts only the leaders in the sector with his money even though their valuations may be higher than their peers. Third, when Basant feels that the rapid growth phase is behind, he cashes out and seeks fresh pasture to graze on. This strategy has served Basant well. He was among the first to recognize that the consumption boom would arrive and he piled on to the leaders therein, Page Industries and Hawkins Cookers, which were then available at beggarly valuations. Similarly, Basant was the early spotter of the opportunity in housing finance stocks. He recommended a buy of Repco Home Finance when it suffered the ignominy of quoting below its IPO price. The same is the case with regard to the B2B Pharma companies. Basant rightly recognized that B2B Pharma companies are relatively immune to the FDA risks and offer steady growth opportunities. Basant’s latest favourite sector is the SMAC (Social, Mobile, Analytics, Cloud) sector. In his latest interview, Basant explained that the “Internet of Things” is destined to become very big in the foreseeable future because there are about 28 billion devices which will be connected to each other. 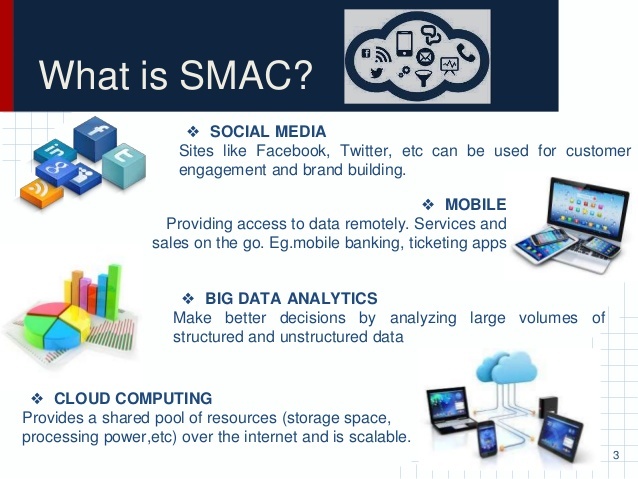 He called SMAC the “the fourth industrial revolution after the steam engine and the internet”. A little bit of digging around shows that Basant is right in his hypothesis that SMAC is the sector of the future and that there is humongous wealth that can be raked in from this sector. Nasscom has pointed out in its “Strategic Review report” that we are “on the cusp of a new era” and that “technology can change the world and empower people and organizations to do amazing things”. Nasscom predicts that by 2020, the Indian IT industry will rake in over $225 billion (Rs 12.5 lakh crore) in revenue and that “emerging technologies and new innovations” in the SMAC space will be the new growth drivers for the sector. The biggest users of SMAC technology appear to be the ecommerce companies. The eCommerce industry in India is presently valued at $17 bn and is growing at a CAGR of 35%. By 2020, the e-tailing market in India will grow to $50 bn, claim experts. KPMG India, which has conducted a detailed study of the opportunities in the sector, has called SMAC a “leading disrupter”. “The increasing pace of change is rapidly driving customer, businesses and technology firms in a tight embrace, with the convergence of disruptive technologies eroding the boundaries separating them. Businesses are becoming more and more agile, and technologies such as social media, mobility, analytics and cloud computing are coming together to unleash unlimited opportunities for everyone involved. This convergence – also known as SMAC – will be the leading disruptor to the business-technology ecosystem over the next few years” KPMG said. Ernst & Young India has also written an illuminating research report on the opportunities in the SMAC space for Indian I. T. companies. Now, the important question from our perspective is which are the companies which we can piggy-back on to harvest the riches of the SMAC sector? Unfortunately, Basant has kept a tight lip on the subject claiming that there are SEBI restrictions that prevent him from divulging names of stocks. However, other ace stock pickers who have also figured out that the SMAC sector is the future are not as reticent as Basant is. 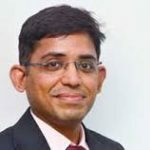 Nilesh Shah later added that both companies, Persistent and Tata Elxsi, “offer a differentiated service to their customers” and have “headroom for growth”.
.@NileshShah68: Focus is on companies with SMAC products rather than services & those that are streamlining operations. A peek at the portfolio of Kotak Midcap Fund reveals that Persistent Systems Ltd rules the roost here. Sandeep Tandon of Quant Capital is the other ace stock picker who is bullish about SMAC stocks. His personal portfolio boats of a massive chunk of 8K Miles Software Services, a hot contender in the SMAC space. 8K Miles has also won the confidence of DSP Blackrock Micro CAP Fund. The stock is up a whopping 1734% in just the past two years. Sonata Software is another contender in the SMAC space. ICICI-Direct has pointed out that “Sonata’s digital offerings (business intelligence, e-commerce, mobility, cloud, Rezopia) now contribute 25% to overall revenues”. Sonata also has a healthy balance sheet and reasonable valuations, ICICI-Direct said. Sonata has also won the confidence of well known investors like Sanjoy Bhattacharyya’s Ocean Dial, Orange Mauritius, Hemendra M Kothari, Goldman Sachs etc. If you are scouting for stocks in the micro and small cap space, you can take a look at Kellton Tech Solutions, which has a market cap of less than Rs. 1000 crore. Kellton claims to do “Digital transformation of your enterprise using SMAC” and promises to deliver “world-class enterprise solutions for developing unique web applications or exclusive mobility strategy”. Kellton is up 251% on a YoY basis. If you are a dare devil and want to look at an ultra micro-cap, Cambridge Technology Enterprises will interest you. The company has a market capitalisation of only Rs. 200 crore. It does, however, have ambitious plans. According to the investors’ presentation, Cambridge is targeting “USD 1 Million in revenue/month by March 2016” and “USD 2 Million in revenue/month by March 2017”. It is also stated that “with continued significant value creation, we target to be a dividend paying company by FY16”. Of course, we must also bear in mind the caution administered by Basant. The stocks in the SMAC sector are likely to suffer a high mortality rate owing to rapid changes in technology. So, we must be careful with the portfolio allocation and not get carried away. 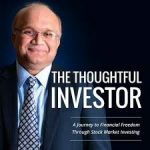 Basant warned that “portfolio allocation is more important than stock selection” and that with a stock where there is no certainty and a high chance of disruption and risk, one should not invest more than 7-8 per cent of the portfolio in the stock. 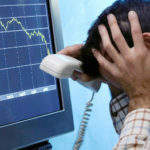 This way, even if the stock plunges 50 per cent, the impact on the portfolio will be contained and made up by the rest of the stocks in the portfolio. One can slowly increase the allocation to these stocks if there is confidence in the business model and growth prospects, Basant opined. He exited all his old stocks which he made us buy as bm subsribers . I am unhappy with him . Why come on TV if you can not name a stock ? why not stay at home then ? People like u made him not to talk abt stocks. Reread ur first two sentences. We all know money can be made in long-run in all sectors except PSU,metal,commodities, airlines,real estate .But if stocks are not clearly mentioned ,it is of no use. Mold Tek Technologies into SMAC and started an offshore delivery center for Salesforce.com customer from Germany. Could be a good growth story. I agree that Basant sir is probably talking about Kellton tech. None of the other companies are showing the kind of revenue growth he was talking about. Whether BM stays invested or is eager to exit (normally, they enter early, keep quiet initially, then spread a bit of rumours, raise the price, and then they decide to exit at which time they come out with such bold recommendations! ), I cant tell. But on my ownanalysis of these SMAC scrips, I think Persistent and Zensar among midcaps will perform well into the future (3-5 years holding). Their fundamental strength is far superior than many others in this space. In small cap, Kellton may do well, but I am worried about two things – one, company from Hyderabad, and second, the CEO is an investment banker and the group has a finance company also (Kellton Securities), so manipulation could be a possibility! Of the large caps, because of Mr Sikka’s presence, Infy will do well in the digital space (its a safe scrip, but not a multibagger). Thanks Gem23 for raising good points about Kellton . I agree with you when a company of market cap around 1000 crores don’t audit foreign subsidiary data then obliviously you can put it in suspicious list . 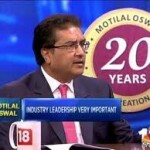 A name is missing in list is Cyient Ltd which has subsidiary Cyient-Insights (http://www.cyient-insights.com/) . I am not sure percentage of total revenue from cyient-insights but It is already establish name in this segment . I think focusing on small caps would be better as compared to large cap and mid cap. Infy and Persistent appear to be the best bets. 8k miles software share is quoting at. Rs. 2123 very high while P/E is 2123 against industry P/E of 21. Moreover the EPS is only one rupee. Can anyone explain? That is Standalone PE. 8k Miles had done many acquisitions in the past and hence we have to see only Consolidated PE, which is around 69 and Consolidated EPS (TTM) of around 30.76. Kellton Tech seems to be growing at a scorching pace. Could be a multibagger even from current levels. Bought a very small quantity today. kellton Tech or 8K Miles..what shud one buy at current prices? Hold till when? Indications are that Kellton will grow its top line & bottom line at an impressive pace in the coming years. Average return on equity of last 3 Years is 28.5% which is very good. ROE in the latest year is 40%. Promoter holding of 62% gives comfort. Debt to equity is slightly high at 1.3x. Stock trading at almost 12x its book value is probably not a good sign from an investment perspective. This appears to be a high risk high return bet. Still worth buying in my view. Price to Book for a IT company is irrelevant. Infact it turns out to be Negative if Kellton has 2 Price to Book instead of 12. Can someone please look at Lycos internet ltd. it’s available at 2 PE . They have paid taxes on profits and also the promoters have bought a couple of lakhs shares a few days back .